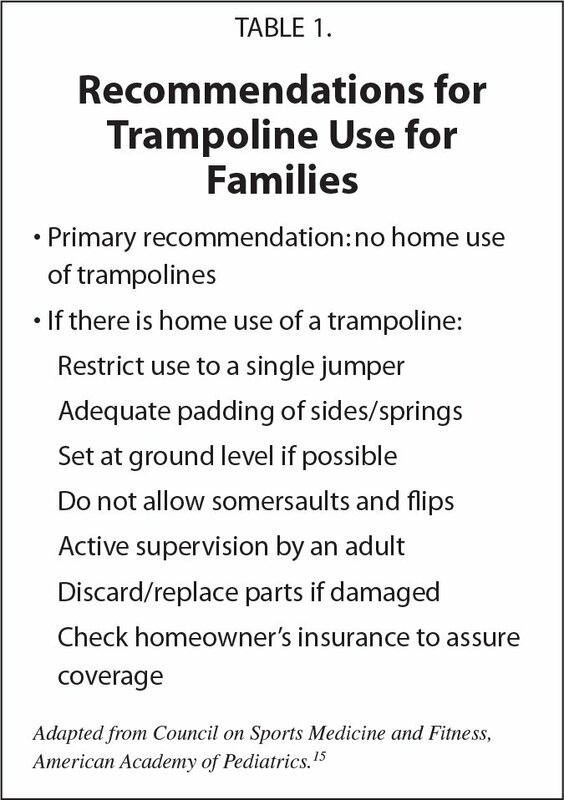 In 2017 there were more than 145,000 medically treated trampoline-related injuries in the United States, most among children younger than age 15 years; 3% of those treated require hospitalization.1 The Consumer Product Safety Commission, through its National Electronic Injury Surveillance System, documented a peak in injuries in 2004 with a subsequent yearly decrease since then.2 A more recent phenomenon is the growing popularity of trampoline parks, which offer many opportunities for trampoline play and exercise. These parks typically consist of wall-to-wall connected indoor trampolines, some of them angled. They often include pits filled with foam pieces or air bags for landing after a jump. Approximately 75% of all injuries occur when multiple people use the trampoline at the same time.3,5 In such a situation, those who are of lowest weight are the most likely to be injured. One study documented that the risk to the lighter person was 14 times that of the heavier user when both are on the mat at the same time.8 Falls from the mat surface account for about one-third of all trampoline-associated injuries,9,10 with injury risk increasing if the child contacts an object on the ground. As mentioned above, trampoline parks are increasing in popularity. The industry grew from only three parks in 2009 to more than 1,000 by the end of 2017.19 With this rise in popularity, injuries in these settings have increased as well, as has the occurrence of severe injuries such as open fractures and spinal cord injuries.12 Attention to safe use and behavior in trampoline parks is important because guidelines vary from park to park. Parents should specifically inquire about park rules pertaining to limiting the number of people on the mat as well as prohibitions about flips and somersaults. Relatively recent voluntary standards aimed at reducing injuries were announced last year by the International Association of Trampoline Parks,20 but their effectiveness remains to be measured. It is not uncommon for children to be exposed to trampolines as part of a structured training program for sports such as gymnastics, skiing, or diving. There are significant differences in trampolines and their use in these settings versus home settings. The mats tend to be bigger, there is a rim of padding around the mat, there is an additional 5- to 6-foot radius of padding on the floor, and supervision is constant.15 No studies have documented patterns or types of injuries in this fairly structured setting, so care should be taken to not extrapolate data from residential settings. Consumer Product Safety Commission. NEISS Data Highlights–2017. https://www.cpsc.gov/s3fs-public/2017-Neiss-data-highlights.pdf?3i3POG9cN.rIyu2ggrsUkD1XU_zoiFRP. Accessed September 26, 2018. United States Consumer Product Safety Commission. https://www.cpsc.gov/Research--Statistics/NEISS-Injury-Data. Accessed September 26, 2018. ASTM International. Standard safety specification for components, assembly, use, and labeling of consumer trampolines. https://www.astm.org/Standards/F381.htm. Accessed September 15, 2018.
International Association of Trampoline Parks. International Association of Trampoline Parks (IATP) statement for the Dr. Oz show https://cdn.ymaws.com/www.indoortrampolineparks.org/resource/resmgr/docs/Dr._Oz_Statement_Final.pdf. Accessed September 26, 2018.
International Association of Trampoline Parks. IATP membership pledge. https://www.indoortrampolineparks.org/page/USAPledge. Accessed September 15, 2018. M. Denise Dowd, MD, MPH, is the Associate Director, Office for Faculty Development, and the Medical Director, Community Programs, Department of Social Work, Children's Mercy Hospital; and a Professor of Pediatrics, University of Missouri-Kansas City School of Medicine. Address correspondence to M. Denise Dowd, MD, MPH, via email: ddowd@cmh.edu.